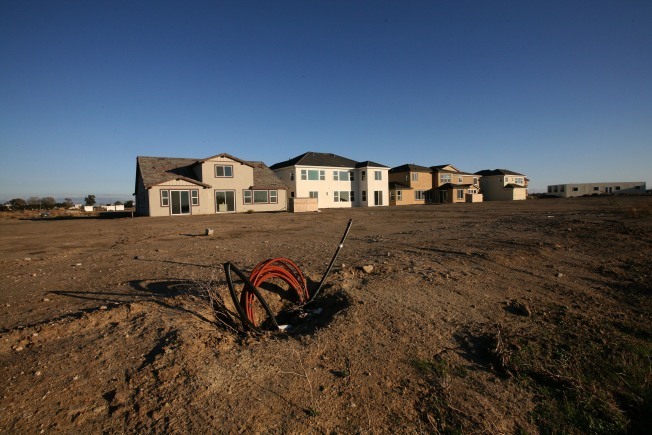 Model homes sit vacant at a 750-home housing development where construction was halted Nov. 20, 2008 in Rio Vista, California. California's unemployment rate jumped to 8.2 percent in October, the highest rate in 14 years, just as a state fund that pays unemployment benefits was about to run out of money. State officials are preparing to ask the federal government to step in with a loan on Dec. 1 so they can continue paying jobless benefits to California's now more than 1.5 million unemployed, nearly a third of whom have lost their jobs in the last year. The largest hit came in the construction industry, which has lost 65,900 jobs in the last year, followed by manufacturing. The department said its monthly survey found 527,918 people were receiving regular unemployment checks in October. But the fund from which California makes those payments is on the brink of insolvency. The state's unemployment insurance fund is expected to have a deficit of $2.4 billion at the end of 2009, forcing it to borrow from the federal government for only the second time since the program was established in the 1930s. If no steps are taken to increase the fund's revenue or reduce its payouts, its deficit is projected to hit $4.9 billion by the end of 2010. Gov. Arnold Schwarzenegger has proposed raising the payments from employers into the fund by $56 to $427 per employee, as well as reducing benefit levels from the current wage replacement rate of 50 percent to 45 percent and raising income eligibility requirements. The governor used Friday's news to remind the state Legislature that urgent action is needed. "We've known for years that changes must be made to the fund to keep it solvent, and it is unfortunate that now, when we need it most, it is racing toward the red," he said in a statement Friday. Schwarzenegger, a Republican, called lawmakers into a special session this month to tackle California's now-$11.2 billion budget deficit. Democrats and Republicans have so far been unable to reach a compromise on a combination of proposals to increase taxes and cut program spending to fill the gap. by hurting the unemployed just when they most need help. them from falling into the economic abyss," said Art Pulaski, executive secretary-treasurer of the California Labor Federation. Also Friday, President Bush signed into law a bill that Congress approved to keep unemployment checks flowing to jobless Americans through the holiday season. The Senate passed the measure after a report released Thursday said new claims by laid-off workers for jobless aid had reached a 16-year high and the number of people looking for work had surged past 10 million. The U.S. unemployment rate hit 6.5 percent in October.